Chongqing LIFAN Holdings Co. Ltd. is a large private enterprise mainly engaged in scientific research & development, manufacturing and marketing (including export) of engine, general-purpose engine and motorcycle, integrated with financial instrument, real estate. By now, LIFAN has a number of staffs of more than 14,800 among them more than 6999 employees are middle-educated or high-educated. LIFAN is continuously listed in China Top-500 enterprises for 9 times and has been No.1 of Chongqing exportation for years. On November 25th 2010, the subsidiary company LIFAN Industry (Group) Co. Ltd was successfully listed in Shanghai Stock Exchange (stock code 601777), firstly publicly issuing 200 million shares and raising funds of 2.9 billion RMB, which is the first private car manufacturer listing in A shares. 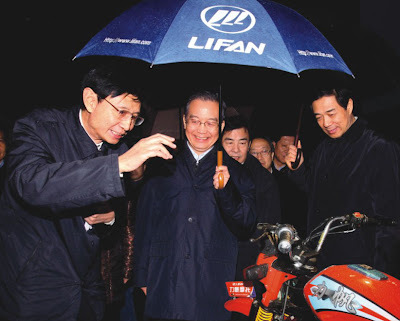 In 2010, LIFAN Holdings won a sales income of RMB16.055 billion Yuan, including production and sales of 181,700 sets of cars, 1.7195 million sets of motorcycles, 3.6148 million sets of engines and 510,000 sets of general-purpose engines with export sales of 428,000 million USD. By December 2010, LIFAN applied 6838 patents including 5650 authorized patents. All indexes indicate LIFAN keeps as the leading position in the field and is one of the biggest taxation contributors among private companies in Chongqing. Lifan is an outstanding example of Chinese national private economic development by all sectors of society community, Ulan has won Chinese Reputed Trademark, China Top Brand, State-level R&D Center, Nation Card, Export Famous Brand, Chinese Best Credit Enterprise for consecutive 9 years and "The Most Competitive Brand" praised by Chinese Ministry of Commerce. And Lifan has topped Forbes of "China's Top500 Enterprises" and "China's Most Valuable Brands". IBM Institute for Business Value and Management School from Fudan University rated Lifan as one of 60 enterprises which can realize internationalization. Mr. Yin Mingshan, Chairman of Lifan Group, has won "Glory Contribution Award for Chongqing Revitalization", "Outstanding Contribution Award for National Quality Management", "Excellent Private entrepreneur for Caring Employees", "Excellent Representative for Building Socialism with Chinese Characteristics", "Chinese Automobile Industry Elite", "China Charily Award" and "Chongqing Outstanding Pacemaker for 60th Anniversary of the of New China". -Published on page#-09 in June-2011 issue of MOBILE WORLD Magazine. © 1999-2012 MW Publications! MOBILE WORLD is a monthly magazine owned by MW Publications started. Simple theme. Powered by Blogger.